The CleanFinancial guide to financial spread betting. Each of the companies in the table below offers a wide range of spread betting markets. Here we have listed a comparison table highlighting of some key differences between the accounts offered. For a more in-depth comparison, including a comparison of the ‘spreads’ and minimum stakes see spread betting companies. 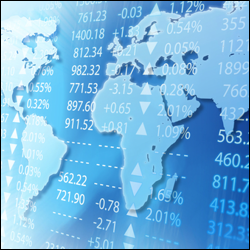 The above companies tend to offer a wide range of stock market indices, shares, forex and commodities markets. It’s important to note that each of the companies is also authorised and regulated by the Financial Conduct Authority. If you’re looking to open a financial spread betting account then note that we have added a quick review of each company. To read the review simply click on the relevant company logo. Please be aware that financial spread betting accounts are subject to status, terms and conditions. CleanFinancial offers more than 500 individual trading guides covering specific indices, equities, FX and commodities markets. The real-time CFD chart below will give users a good overview of the FTSE 100 index market. The CFD chart above is provided by Plus500 and typically uses the FTSE 100 futures price (not the daily market). If you want to access live financial spread betting prices/charts for the FTSE 100, an option is to use a spread trading account. You can also use a spreads account to access the short-term daily prices. Please note that such accounts are subject to credit and status checks. Should your account application be accepted then you can log on and see the real time prices/charts. Usually, these are provided as part of the service. The catch? You might receive the odd sales letter or email from the relevant spread betting firm. If you do decide to trade then be aware that CFD trading and financial spread trading involve a significant level of risk and it’s possible to incur losses that exceed your initial deposit. Below we have listed the financial spread betting companies that provide clients with trading charts. Most firms provide account holders with free charts and, like the FinancialSpreads example below, normally you can choose candlestick charts. In most cases you can change the time settings so that you can view market movements in 1, 2, 3, 5, 10, 30 and 60 minute intervals. If you prefer a medium-long term view then you can also set the charts to daily and weekly intervals. Some financial spread betting firms offer investors software and trading platforms that you can download. Nevertheless most providers, such as the ones listed below, offer more user-friendly web-based platforms. 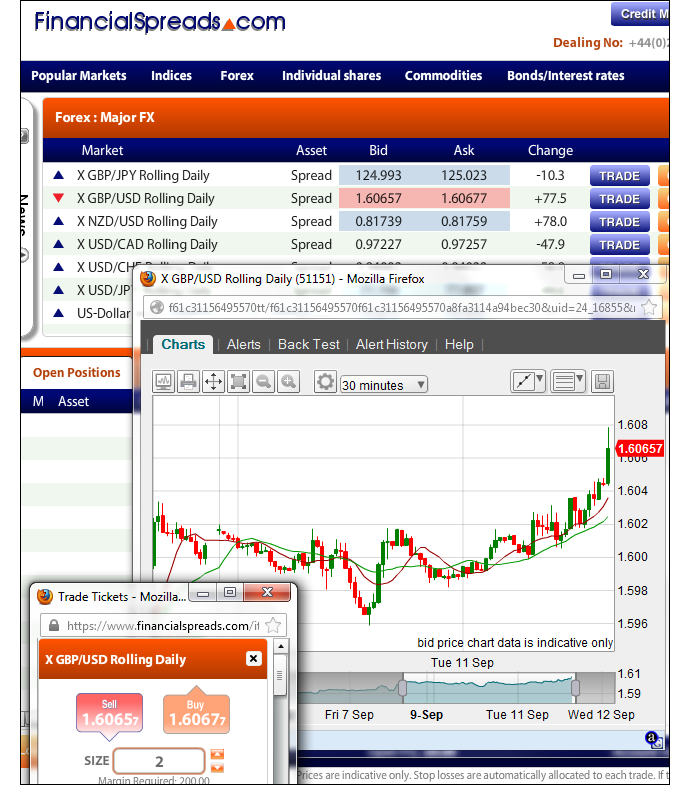 With a web-based trading platform you don’t need to install any trading software. A web-based platform will also normally let you access your account from home, the office and most other places with web access. Each of the following firms also provides their account holders live spread betting prices. Spread Betting Firm Live Prices? If you’re less familiar with certain markets or if you would like to test out some new trading theories and strategies then it might be a good idea to test them on a spread betting Test Account / Demo Account. These are free accounts where you can practice trading on numerous spread betting markets without risking your capital. If you’re spread betting it is important to understand that you can lose. All forms of investment, from trading stocks to CFDs and ETFs, have a negative side. If you spread bet you can lose more than you initially staked. Spread betting does carry a high level of risk so before you trade, please ensure that it matches your investment objectives. Familiarise yourself with the risks involved and seek independent advice where necessary. A simple way of reducing your risk is trading with smaller stakes. You can trade with smaller stake sizes such as £1 per point with most firms. You can also trade with £0.50 per point with ETX Capital and Financial Spreads. A Stop Loss is a trading order intended to help an investor if they’re making a loss. Stop Loss orders will close your trade if and when the underlying instrument goes against you and past the Stop Loss level. You can normally specify the level that the Stop Loss is set at. Note that Stop Losses are not guaranteed, if the market were to gap (jump) over the level of your Stop Loss, then your trade will be closed and settled at the next price that’s traded. A bonus with a Stop Loss is that it does not limit your upside. These orders work in a similar manner to a normal Stop Loss however the closing price level of your spread bet is guaranteed. So even if the underlying market you are trading gaps over the level of your Guaranteed Stop, your trade will still be closed at the level that you originally specified. Be aware that if you choose to add a Guaranteed Stop to your spread bet, then there is generally a modest premium to pay for the extra protection. The premium normally comes in the form of a wider spread. Also, like a Stop Loss, a Guaranteed Stop does not limit your upside. As mentioned above, you can trade with £1 per point stakes. If you speculate on the FTSE 100 to go up with a £1 per point stake and it goes up by 85 points then you would make 85 points x £1 per point = £85. Conversely, if the market went against you and the FTSE 100 dropped by 70 points, then with a £1 stake you would lose 70 points x £1 per point = £70. Of course this would not be a great way to start. However, you could set a Guaranteed Stop at let’s say, 45 points. If you were betting on the FTSE 100 then your bet would be closed if the FTSE 100 moved against you by 45 points. Therefore, instead of losing £70, you’d only lose 45 points x £1 per point = £45. However, assuming you correctly predicted the direction of the market, your profit would still be £95 if it moved 95 points or £55 if the FTSE 100 moved 55 points. Limits Orders are intended to help you when you’re in the black and making a profit. A Limit Order will close your position if the underlying market you are trading moves, in the direction that you correctly forecast, by a specific amount. Again, you can normally select the level that the order is set. This basically means that Limit Orders will automatically close a position in order to lock-in your profit. Limit Orders can be useful because they stop you from getting carried away and keeping your trade open for too long. All three trading orders can help you carry out your strategy simply by helping you close spread bets at the price levels you wanted. The trading orders also tend to be invaluable given that you can’t keep an eye on the financial markets throughout the day. This is particularly true when you consider that a number of the more widely traded markets are open overnight. At this stage you might be thinking to yourself, this all seems very positive but what’s the catch? Well, as we have said, there are risks. So, maybe we should go into more depth about how a trade works. The FTSE 100 is normally the most popular spread betting market. Looking at the Financial Spreads website, they are pricing the FTSE 100 Rolling Daily market at 6,836.5 – 6,837.5. When spread trading on the FTSE 100 index you trade in £x per point. So, if you choose to risk £4 per point and the FTSE 100 moves 34 points then that would alter your profits (or losses) by £136. £4 per point x 34 points = £136. One important thing to note is that this is a ‘Rolling Daily Market’ and therefore it does not have a set closing date. If your trade is still open at the end of the trading day, it simply keeps rolling over into the next trading session. To see a fully worked example read Rolling Daily Spread Betting. Then you could buy at 6,837.5 and risk, let’s say, £3 per point. So, you gain £3 for every point that the FTSE 100 index moves above 6,837.5. However, you will lose £3 for every point that the FTSE 100 market falls lower than 6,837.5. Put another way, if you were to buy a spread bet then your profit/loss is found by taking the difference between the settlement price of the market and the price you bought the market at. You then multiply that price difference by your stake. As a result, if after a few sessions the stock market moved higher then you might want to close your position in order to lock in your profit. Spread betting is not always straightforward. In this example, you wanted the index to rise. Of course, it could fall. If the FTSE 100 index had started to drop then you could close your trade in order to restrict your losses. Note – FTSE 100 Rolling Daily spread betting price accurate as of 25-Oct-12.